Kantha, or “patched cloth,” is an embroidery tradition coming from countries such as India and Bangladesh in the Bengal region of South Asia. Kantha refers to both the tradition and the actual stitch involved in producing unique quilted blankets out of worn cotton saris, sewn together with a distinctive running stitch that covers the entire quilt. Using the kantha technique, Bengali women have repurposed their old saris for centuries for the practical purpose of keeping their families warm. Over time, however, kantha has developed into an artform that allows women to have more self-expression through their creations. Today kantha has gained popularity in the West due to its beauty, intricate designs, and the unique nature of each piece. Since fair trade kantha products repurpose saris that would otherwise be thrown out, the production of kantha goods has a low environmental impact and helps empower women artisans in the developing world. Kantha jewelry is an example of fair trade’s resourcefulness, turning old, worn saris into beautiful accessories. Each Kantha bead has a wooden base which is then hand-covered by an artisan with a colorful Kantha scrap and secured with a safe adhesive. Excess fabric is then trimmed off and the bead is complete! 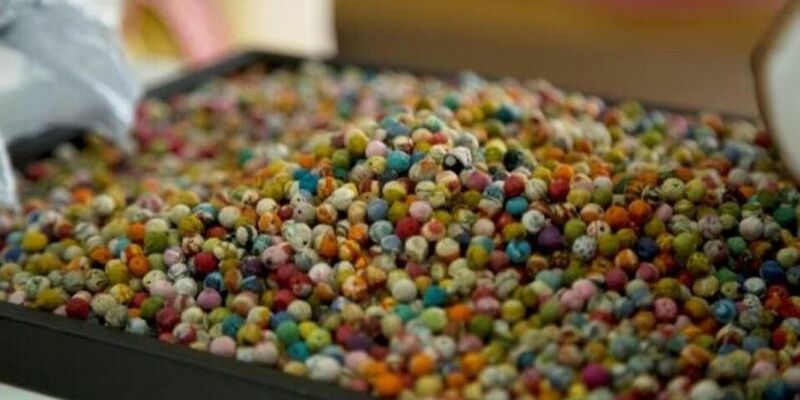 Once a number of beads have been crafted, they can be strung together into a necklace, wrapped with wire and added into a bracelet, or transformed into an earring. Click here to shop our recycled sari items! Kamlesh worked as a receptionist before she was married at the young age of 17. She had not wanted to marry that young, but her parents insisted. Within a year, her daughter Anjali was born. Kamlesh is a progressive woman who resisted being housebound. Her husband was a driver, but his income wasn’t enough to provide for their small family. Kamlesh tried to seek another source of income but struggled to find employment that also allowed her to care for her daughter. Soon her son Mohit was born and the family found themselves in an even tighter financial situation. Happily, Kamlesh connected with a fair trade artisan group and learned how to make jewelry and accessories. She also found encouragement from the women in the group, which was invaluable as her husband was struggling with alcoholism and she faced even more responsibility at home. Soon she was earning enough to support herself and her children. Kamlesh eventually became a full time employee at the group’s office, and with the help of WorldFinds’ Girls Education Fund, Anjali’s school costs are being taken care of. Her husband is currently doing better and they have reconciled, but Kamlesh feels secure knowing that she can provide for her children no matter what the future holds. Want to know more about how Kantha jewelry is made? Check out the video below!